The PPE (Personal Protective Equipment) requirements to work on live electrical equipment is making commissioning, startup, and tuning of electrical control systems awkward and cumbersome. We are at a stage where the use of PPE is now required but practice has not caught up with the requirements. While many are resisting this change, it seems inevitable that we need to wear proper PPE equipment when working on any control panel with exposed voltages of 50 volts or more. With many electrical panels not labeled for shock and arc flash hazard levels, the default PPE requires a full (Category 2+) suit in most cases, which is very awkward indeed. 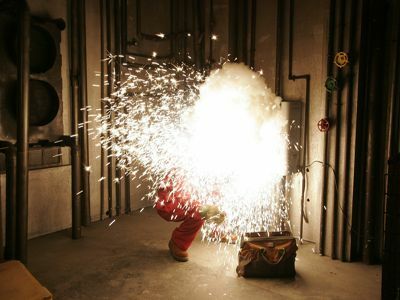 What can we do to allow us to work on live equipment in a safe manner that meets the now not so new requirements for shock and arc flash safety? Increasingly the thinking is to design our systems for shock and arc flash safety. Typically low voltage (less than 50 volts), 120VAC, and 480 VAC power were often placed in the same control enclosure. While this is cost effective, it is now problematic when wanting to do work on even the low voltage area of the panel. The rules do not appear to allow distinguishing areas of a panel as safe, while another is unsafe. The entire panel is either one or the other. One could attempt to argue this point, but wouldn’t it be better to just design our systems so that we are clearly on the side of compliance? Here is one thought to improve electrical shock and arc flash safety by designing this safety into the electrical control panels. Keep the power components separate from the signal level components so that maintenance and other engineers can work on the equipment without such hazards being present. That’s the principle. What are some ideas for putting this into practice? Run as much as possible on 24VDC as possible. This would include the PLC’s and most other panel devices. A separate panel would then house only these shock and arc-flash safe electrical components. Power Supplies could be placed in a separate enclosure or included in the main (low voltage) panel but grouped together and protected separately so that there are no exposed conductors or terminals that can be reached with even a tool when the control panel door is opened. Motor Controls running at anything over 50 volts should be contained in a separate enclosure. Try remoting the motor controls away from the power devices where possible. This includes putting the HIM (keypad) modules for a VFD (Variable Speed Drive) for example on the outside of the control panel, so the panel does not have to be opened. Also, using the traditional MCC (Motor Control Centers) enclosures is looking increasing attractive to minimize the need for PPE equipment. As I write I realize that I’m just scratching the surface on this topic. For example “finger safe” design does not meet the requirements for arc flash safety. Also making voltage measurements to check for power is considered one of, if not the most hazardous activity as far as arc flash goes.